Home // Biblical Principles // Have You Prayed Today? 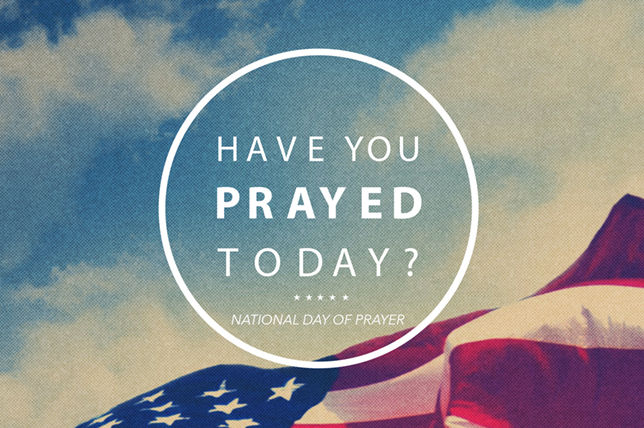 All across our country today, believers gathered to pray for our nation on the National Day of Prayer. I was honored to speak at a “Macon Area Prayer Breakfast” hosted by First Presbyterian Church. Then, at noon, I spoke at a “Rally for our Nation” held at Rosa Parks Square across from the Macon-Bibb Government Center in downtown Macon. The following are the remarks that I shared at the rally. In the summer of 1787, representatives met in Philadelphia to write the Constitution of the United States. After they had struggled for several weeks and had made little or no progress, eighty-one-year-old Benjamin Franklin rose and addressed the troubled and disagreeing convention that was about to adjourn in confusion. And so it was in prayer that the very framework of our constitutional republic was forged and crafted. How appropriate then, that today, we be called again to earnest and fervent prayer on behalf of our country. A call similar call went out on April 30, 1863, from the pen of Abraham Lincoln, when as President, he called for a National Day of Fasting, Humiliation, and Prayer. So, by our prayers today, we put our hope in God, and not in our own wisdom or our own devices. By our prayers today, we acknowledge the Sovereignty of Almighty God, the Creator of Heaven and Earth, who alone is worthy of our praise and worship and whose purposes stand firm through all generations. By our prayers today, we confess our sinfulness and repent of our wicked ways and ask forgiveness and cleansing through the shed blood of God’s Son our Savior, the Risen Lord Jesus Christ, who alone is “the way and the truth and the life” (John 14:6). By our prayers today, we affirm the gospel of the Lord Jesus Christ, a gospel that is “the power of God for the salvation of everyone who believes” (Romans 1:16). By our prayers today, we acknowledge the foolishness of expecting our young people to value human life when through our media we have glamorized and glorified violence and through abortion have taught them that the taking of innocent human life may be done legally and with impunity. By our prayers today, we give thanks to God for the gift of family, and the gift of marriage, which God intends to be a life-long, loving covenant relationship between one man and one woman for the glory of God. By our prayers today, we acknowledge our responsibility to teach our children by our own example to love the Lord, our God, with all our heart, soul, mind, and strength, and to love our neighbors – even those with whom we may disagree – as ourselves (Matthew 22:37-38). By our prayers today, we intercede for those who are in authority over us that they will regularly seek God’s wisdom and will joyfully embrace God’s standards of righteousness which promote human flourishing and are for the common good, for the Bible says: “Righteousness exalts a nation, but sin is a disgrace to any people” (Proverbs 14:34). By our prayers today, we declare that our ultimate allegiance is to God and to His Word. We will gladly and ungrudgingly “give to Caesar what is Caesar’s,” but regardless of the cost, we will give only to “God what is God’s” (Matthew 22:21). By our prayers today, we plea for God’s favor, we cry out for God’s grace, and we yearn for God’s blessing to again be bestowed on our families, our communities, and our nation—to the glory of His great Name. We say together today, in the name of our Lord Jesus Christ, hear our prayers O God! Amen.